Target Audience: year 9 students that are able and interested in computer science. Format: 7 Saturday mornings, approximately fortnightly, over the spring and first half of summer terms. Aim: to encourage, inspire and engage students in exploring computer science. How to get involved: teachers are invited to nominate students in the autumn term of year 9. Ri Computer Science Masterclasses are a series of workshops which are led by experts from industry, academia and education. They offer students in-depth investigations of topics in Computer Science, combining theory with interactive exploration. We will open their eyes to the world of Computer Science and hope to inspire them to continue their engagement with the subject. 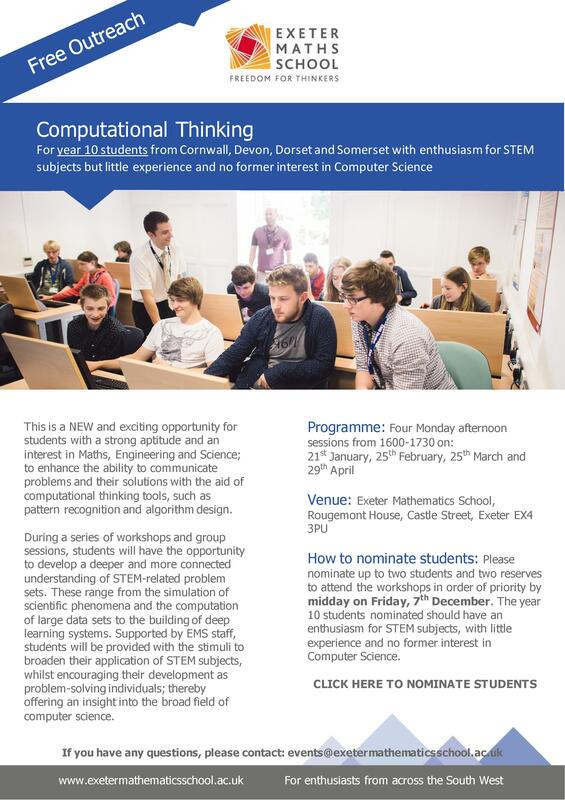 The year 9 students nominated should be interested and enthusiastic about mathematics, engineering and science as well as being judged to have potential and interest in the classes. We aim to challenge students who are well-motivated and curious about Computer Science. Nominations for the 2018/19 programme have now closed – please contact events@exeterms.ac.uk if you have missed the deadline and are a teacher interested in nominating students to attend. Target Audience: for year 10 students from Cornwall, Devon, Dorset and Somerset with an enthusiasm for STEM subjects; little experience and no former interest in Computer Science. Format: 4 workshops held at EMS from 1600 to 1730, spread over the spring term. Aim: to enhance the ability to communicate problems and their solutions with the aid of computational thinking tools, such as pattern recognition and algorithm design.